Moving away from the creation of recognizable works, art becomes an experimental territory for producing subjectivities – according to the “ethico-aesthetic paradigm” of Felix Guattari. But what does that paradigm entail? How do forms of contemporary artistic practice lead their participants outside the dominant modes of subjectivation? How do they lend a different structure to cooperation? How do they take up threads from the past, displacing them onto the terrain of experience? Makrolab is a collaborative project that emerges from the vision of the Slovene artist Marko Peljhan. It offers some answers to these questions – singular answers. To make them useful in any general way, one would first have to approach the project in its multiple dimensions, to discover its stakes and challenges, to locate its contexts and learn to read its codes. Is it sculpture or architecture? A concept or a performance piece? A nomadic war machine, or a theater to replay history? The difficulty, when you want to perceive a project like this, is to let yourself enter the horizon of its possibilities, even while analyzing its specific features. What strikes you first is the object’s technical aspect, its glistening, futuristic exterior, bristling with sensors and aerials. Makrolab has been designed on a modular principle, for easy disassembly and transport by container. It comes together as an extruded octagon with a flattened base, outfitted with wooden floorboards, sheathed in translucent plastic panels, lined with silvery insulation and raised off the ground by tubular legs. Inside, it is divided into four functional zones: kitchen, workspace, dormitory (8 bunks), shower and toilets. In front, a metal staircase leads up to a narrow airlock, which rises vertically at the push of a button. On the other side, a larger hatch opens up like an awning over a gridworked terrace. Solar panels and a windmill furnish electricity, with backup from a generator; a waste-treatment system allows for minimal water consumption; communication is assured across the electromagnetic spectrum, notably by satellite links. 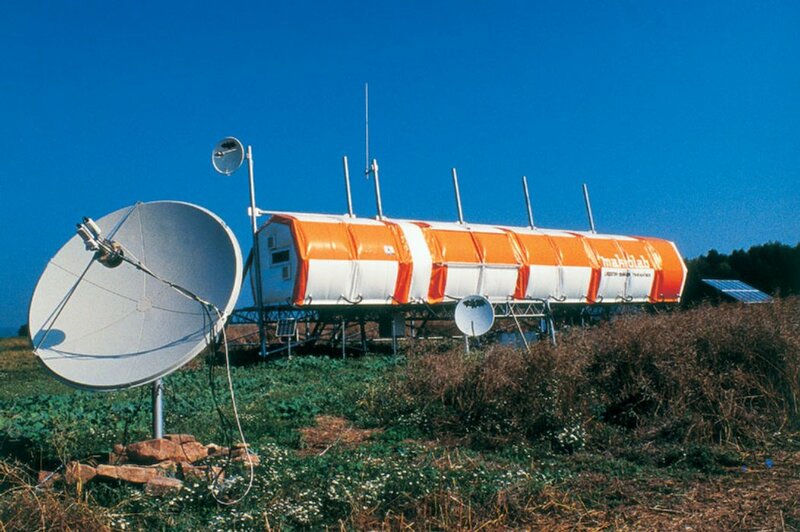 Mounted in desolate environments, it looks a meteorological research center, or even more, like a stranded space station. 1994 is the year when the Internet boom began, on the transnational markets but also in our imaginations. Peljhan had already entered the art scene with a series of performances; now he moved toward the world of media activism, as a cofounder of Ljudmila, a group devoted to autonomous uses of the new communications technologies. Inspired by the Russian aesthetic of faktura, which calls for a mix of sensory qualities and abstract ideas, he worked on the design of the laboratory with two architects, Bostjan Hvala and Jurij Krpan, and with Luka Frelih for the communications systems. 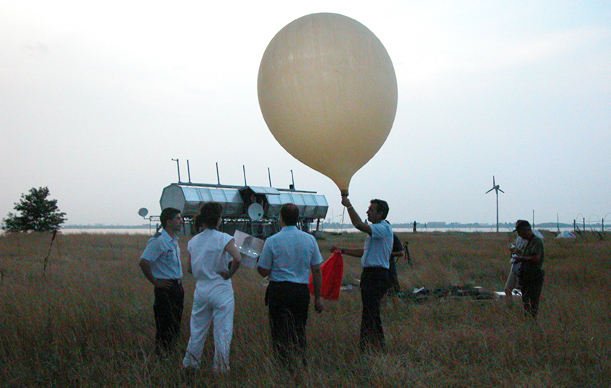 A prototype, Makrolab Mark I, was included in the program of Documenta X and installed for the summer of 1997 on Lutterberg Hill, several miles away from the city of Kassel. That is where the choreographer Johannes Birringer discovered the mobile laboratory, and wrote the first significant text about it. Birringer is a stage performer, known for his digital dances; but paradoxically, he seemed only to perceive the technical and activist sides of the project: “Launching an artistic process that yields knowledge and insight into the evolution of the electronic ‘public sphere,’ Makrolab intervenes into the radio and telecommunications circuits to test the conditions under which transmission technologies operate and under which the relations between communicating individuals can be empowered,” he wrote. The empowerment came through the reception and decoding of civil and military transmissions, carried out in collaboration with the American artist Brian Springer. The early experiments of “tactical media” were in full swing: it was a rush to appropriate and transform the functionalities of the new computerized media tools, before they disappeared beneath the surface of commodified forms that would permit no further improvisation. Birringer locates Peljhan and Springer’s practice on the borderline between the new technologies and the techniques of the historical vanguards (collage, readymade, cut-up, drift). The specific difference of the contemporary mixes, in his view, was the framework within which they were exchanged: no longer did the artists address the classical institutions (magazines, galleries, museums) but instead the new public spheres of the NGOs, and above all, the “gift economies” of the net activists. Eshun understands the experience of the participants as a micropolitical transformation of the data yielded by the technical capacities of the laboratory, by the natural and cultural environment where it is installed, and by the informational sphere that it continuously probes. But what he concludes is that the artistic aims of the Makrolab find their most concentrated fulfillment, not in a work or a performance, but in the lives of its inhabitants. The artifacts they produce, the diaries, the photos, the maps, the streams of remixed information – in short, everything that could be displayed in a traditional museum – make up a flux of constantly evolving material, a “dataesthetic” that seeks to “immerse the insensitive and impervious viewer in the information networks that provide the operating systems of the planet.” What distinguishes artist from viewer appears to be the degree of immersion. The change of address thereby comes to signify a mutation in the concept of art, which no longer exists to be contemplated from the outside, to be appreciated as bounded whole (in its form, its complexity, its internal harmonies or disjunctions), but only appears as a by-product, a kind of secondary trace – raw material pointing back toward the immanence of lived experience. There is certainly a connection between the immanence of life-experience and the operational mode of a project like Makrolab, which constantly creates a difficulty of approach, so as to offer an initiatory path from distant spectatorship to direct, intensive collaboration. At stake is a resingularization of the dominant semiotic codes, whose capacity to structure society has become so visible with the spread of computerized networks. Still the most interesting questions seem to disappear, when all the attention comes to focus on an ontological divide between the uniqueness of being and the threatening sterility of digitized repetition. What is eluded are the essential problems of the activity itself, its contents, its processes, its aims. If technological decisions shape our lifespans, don’t we need to know what they are and how they are taken? According to which priorities, which orientations? Isn’t it urgent to find out how can a critical distance or disjunction be achieved, without losing the immanence of lived experience? And for that, don’t we need to distinguish between the coercive forces of biopower and the reflexive practices of biopolitics? “Insulation/isolation is understood as a vehicle to achieve independence from and reflection of the actual entropic social conditions…. The thesis is that individuals in a restricted, intensive isolation can produce more evolutionary code than large social movements.”  This is Makrolab’s ethico-aesthetic program: it is a generative matrix, a device for producing evolutionary code. But it is impossible to grasp the specific language of this device – its crisscrossing of scientific and artistic experiments within a retro-futurist architectural vehicle – without recalling the full political and cultural complexity of the crisis of the former Yugoslav state, then the “transition” to Western (i.e. capitalist) democracy. What’s missing from the earlier studies of Makrolab is an account of its departure points. Marko Peljhan grew up in the Federal Republic of Slovenia in the 1980s, where he studied theater and radio. It was the heyday of the industrial rock band Laibach, then of the broader art movement known as NSK (Neue Slowenische Kunst) – a time when cultural revolt took place through what philosopher Slavoj Zizek called an “over-identification” with the most explicit symbols of authoritarian power. In 1986, Peljhan saw the NSK theater spectacle “Baptism under Triglav,” staged by the Scipion Nasice Sisters Theater, with music by Laibach and scenography by the painting collective Irwin. For an entire generation it was an initiation to the transgressive powers of art – but also to its utopian potential: “The Scipion Nasice Sisters Theater regards the utopian instinct as an innate, but not acquired, value which exists in man in the form of a desire for a unity with the Cosmic, Aesthetic and Moral elements. That is why the creation of the Style of the Scipion Nasice Sisters Theater cannot originate in the Actor, Space or Staging, but only in Culture and Civilization, renewed and recurrently traumatized…”  The paradox of Slovene art in the 1980s was to express its utopia through a merciless “retro-production” of the historical traumas of civilization. The cultural ferment of the time included an explosion of social movements: punks, pacifists, feminists, homosexuals, ecologists, joined after 1986 by the official youth organization, with its dissident newspaper Mladina. Soon came the “Slovene Spring” of 1988. Democratic elections, followed by national independence in 1991, ushered an entire society to the other side of the authoritarian curtain – and into the dissolving embrace of postmodern capitalism. The exit from communism would be marked by a double imaginary, of boundless space and the capsule. How to move from a relatively closed, tightly-knit provincial society – bound together in resistance against the central government – to the wide-open, dizzyingly expansive environment of globalization? In 1992, in a video accompanying the release of the album Kapital, the musicians of Laibach appear in the guise of cosmonauts, inside a rocket ship decorated with Suprematist crosses. The year before, the members of Irwin had invented the NSK State in Time, and inaugurated the series of NSK Embassies. In the absence of the totalitarian foil that had given meaning to the transgressive gestures of over-identification, they attempted to establish their own limits as a social entity, tracing borders that were no longer spatial but temporal: “In Moscow this model of a voyage – as transposition of the entire group – was tested for the first time, and it confirmed our assumption that with such projects an autonomous NSK territory can be defined; a territory capable of moving, not confined by geographical, national and cultural borders; a territory realizing its own notional space.”  But it was Dragan Zivadinov, the director of Cosmokinetic Cabinet Noordung (successor to the Scipion Nasice Theater) who went the furthest with the imaginary of the capsule, orchestrating in 1995 the first in a series of complex performances, carried out in a sculptural stage-set resembling a space vehicle. All this clearly resonates with the imaginary of Peljhan’s work – and indeed, Peljhan would later collaborate with Zivadinov on the first-ever zero gravity theatrical performance, held in 1999 in an Ilyushin jet used by the Russians for cosmonaut training. Yet a fundamental difference separates him from the generation of the 1980s, a difference involving the very conception of artistic practice, and of its role in society. 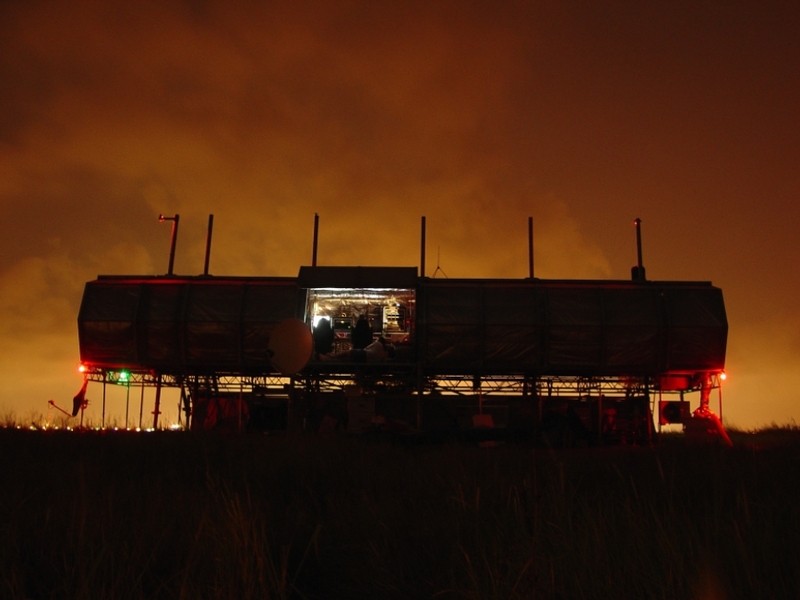 Being real means obtaining funding, logistical support and cultural prestige for an expensive sci-art project that originates from a small Eastern country and operates subversively on the fringes of the globalized exhibition system, drawing on the autonomous energies of the hacker ethic and the tactical media crowd to conduct “civilian counter-reconnaissance” with high-tech equipment. This unusual position has led the Makrolab team towards a disarming critical pragmatism in negotiations with a wide range of partners, from the Documenta and the Venice Biennial to a British foundation (Arts Catalyst), a Slovene mobile phone company (Mobitel UMTS), or the Russian aerospace bureaucracy of Star City. Self-institutionalization under an ambiguous postnational status becomes a way to slip through the cracks of the world-spanning technological systems. The contrast could hardly be greater with the transition strategy of NSK’s Irwin group, culminating in the recent East Art Map. This vast and brilliant project aims to integrate little-known practices from the former Soviet bloc into expanded history of contemporary art – a history as yet unwritten, but henceforth plotted out as a network of names, dates and places, establishing a territory that can be slowly invested by complex institutional and historiographic processes of comparison, evaluation, legitimation. If the NSK project succeeds, the “notional spaces” documented by the map will slowly be reterritorialized, inscribed within a supporting framework of museums, galleries, critical discourses, publications and collections. 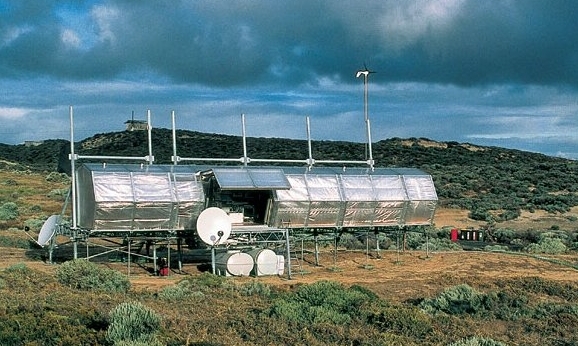 By contrast, Makrolab gathers its historical references and unrealized utopias into a semi-autonomous material structure that seeks to ride the deterritorializing wave of post-Cold War expansionism towards far-flung listening posts such as Rottnest Island, Australia (where the laboratory was installed in the year 2000), and ultimately, to the transnational space of Antarctica, where the conditions of insulation/isolation could be pushed to their limit. The vanguard ambition of “overcoming art” here combines with the “radical media pragmatism” of libertarian net-culture in the late 1990s, with its acute awareness of “infowar” and its confrontational approach to all the established circuits of distribution. From the start, Peljhan seems to have relished the contradictions between activist subversion and institutional backing. To close his first series of performances at the Galerija Moderna in Ljubljana in 1993, amidst the turmoil and uncertainty of the transition to capitalism, he called for a public debate between artists and businessmen. Among the latter was the art patron Andrej Drapal, the producer of Peljhan’s own series and an associate of the Slovene public-relations firm Pristop, which had already begun to exert a decisive influence on the development of culture and communication in the newly independent country. Two words were written on a reflecting glass pane hung behind the invited guests: Power/Religion (PR). Peljhan arrived in the room, opened a suitcase installed on a pedestal, took out a hammer and violently shattered the mirror, then sat down among the public to let the debate unfold between equals. Makrolab is a sophisticated attempt to pass through all the ideological screens that configure the religion of networked power. In this respect once again it is a Khlebnikovian utopia, asserting the rights of the “inventor-explorers” against the more assured claims of the “investor-exploiters.”  The utopia is encoded through the abstract materiality of faktura, which in this case means: conceptual art, modular architecture, hi-tech engineering, computerized communication systems. But the project is also oriented by a reflection on the modulation of time, conceived as a control procedure: “We are constantly defined by time, timetables, dates, our lives are planned, the time stamp of our computer messages, our electronic identifications place us in the abstract and immaterial space of the networks…. Space has in the first world lost its place in consciousness over time and with this loss, a loss of orientation senses occurred too. A loss that has never occurred to the centers of power.”  Discovering how life-decisions are made at the scale of globalization means locating the men and machines who control the human flow – a pragmatic response to Groys’ concern with “time artificially produced and fashioned.” Even while shrinking the intimate space of groups of researchers living in microcommunity, Makrolab enlarges its cartographic explorations to all the sites and frequencies of power. In this way, it participates in the groundswell of geographic activism that has attempted to track the expansion of transnational capitalism. Biopolitics – the consciously cooperative creation of life’s artificial frameworks – defines itself in resistance to the coercive biopower that is exercised on human time. Considerable stakes underlie this kind of project, though they are rarely formulated in any explicit way. No one can work on the recurrently traumatic structure of technological civilization without realizing how deeply its military origins reach into the fabric of our daily lives. Indeed, the American military expansionism of the Second Cold War (1980-89) is what sparked the globalization process, culminating in the events of September 11 and the invasions of Afghanistan and Iraq. At the very outset of the eighties, Deleuze and Guattari conceived the heteronomous model of the “nomadic war machine” as a strategy to undermine the military hierarchies of contemporary civilization. This is what Peljhan more pragmatically calls the conversion of military to civilian technologies. But to understand how this could even be attempted, is it really enough to say, as Eshun and Groys have done, that art becomes life, and artwork becomes documentation? The language of Makrolab suggests something else: a generative matrix, close to the models of social evolution developed in Guattari’s complexity theory. Guattari tried to understand how people can leave behind their embodied routines, their existential territories, by transiting through a machinic assemblage capable of producing collective enunciations. Makrolab achieves this by bringing the deterritorializing force of scientific formulas and artistic images into play on the experiential level, the level of active engagement. What results for the participants is not any simple decoding of contents encrypted in an artistic form (or even less, in a “documentary installation”). Rather, within a device that encapsulates certain aspects of the Slovene experience, fragmented images from a wider variety of vanguard projects can knit together into complex sensorial refrains, interrupting the normalized modulation of time imposed by the commercial and military cultures of transnational capitalism, and loosening up subjectivity for original work with the most challenging scientific and symbolic material, at variance with the dominant patterns. Each of participants then adds something to the device, to its pool of references, tools, algorithms and images – to its horizon of evolutionary code. The end-products of the “dataesthetic” can therefore be interpreted somewhat differently, outside the gap between raw documentation and the ineffable immanence of lived experience. For the vital activity of the researcher does not just produce data in the etymological sense: mere “givens” excerpted from the dominant flux. Instead these maps, images, films, diaries, programs, soundscapes, texts and streaming signals are artistic and scientific gifts – offered to other sites, other devices, other receivers, other possible futures. 1 Eda Cufer, “An Interview with Marko Peljhan,” in Geopolitics and Art (Ljubljana: SCCA, 1999); online under a different name (and without the opening paragraph quoted here) at http://www.manifesta.org/manifesta3/newsletter7.htm. 2 Félix Guattari, Chaosmosis: An ethico-aesthetic paradigm (Bloomington: Indiana University Press, 1995). 4 Marko Peljhan, “Krk,” in Makrolab (The Arts Catalyst/Projekt Atol, 2003); online at http://makrolab.ljudmila.org/vision/krk. 5 Johannes Birringer, “Makrolab: A Heterotopia,” in Performing Arts Journal n° 60 (1998); online at http://makrolab.ljudmila.org/birringer.html. 6 Kodwo Eshun, “Makrolab’s Twin Imperatives and their Children Too,” in Makrolab, op. cit. 7 Boris Groys, “Art in the Age of Biopolitics: From Artwork to Art Documentation,” in Documenta 11, cat. (Ostfildern: Cantz, 2002); online at http://www.ranadasgupta.com/notes.asp?note_id=34. 8 Marko Peljhan, “Isolation/ Insulation Proceedings,” lecture at Documenta X, online at http://makrolab.ljudmila.org/peljhan1.html. 9 On the theme of over-identification, see Laibach, “10 Items of the Covenant,” online at http://www.ljudmila.org/embassy/3a/10.htm; Slavoj Zizek, “The Enlightenment in Laibach,” in Inke Arns, ed., Irwin: Retroprincip, 1983-2003 (Berlin: Künstlerhaus Bethanien et. al., 2003); and the film by Michael Benson, Predictions of Fire (90”, 1996). 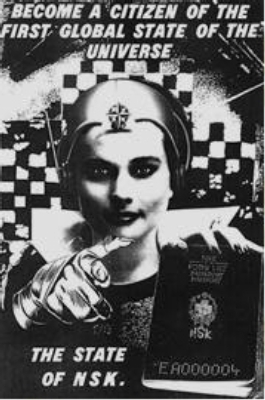 10 Scipion Nasice Sisters Theater, “The Founding Act” (1983), online at http://www.ljudmila.org/embassy/4a/2.htm. 11 Laibach, “Wirtschaft ist Tod” (1992), in the DVD Laibach – The Videos (Caroline Distributio: 2004). 12 Remarks by Miran Mahar, from “The Symptom of the Vehicle,” interview with Irwin by Eda Cufer, in Irwin: Retroprincip, op. cit. 13 For an account see Michael Benson, “Noordung Zero Gravity Biomechanical Theater” (1999), online at http://www.nskstate.com/noordung/noordung-benson.php. 14 Eda Cufer, “An Interview with Marko Peljhan,” op. cit. 15 Remarks by Marko Peljhan, quoted in Kodwo Eshun, “Makrolab’s Twin Imperatives and their Children Too,” in Makrolab, op. cit. 16 For an example of “civilian counter-reconnaissance,” see http://www.s-77ccr.org. 17 See New Moment #20, Ljubljana, 2002, special issue, “East Art Map”; introductory text online at http://www.nskstate.com/irwin/works-projects/eastartmap.php. 18 See Geert Lovink, “Radical Media Pragmatism,”in Infowar (Linz: Ars Electronica, 1998); online at http://www.aec.at/en/archives/festival_archive/festival_catalogs/festival_artikel.asp?iProjectID=8436. 19 These terms are from Marko Peljhan, “Insulation/Isolation Proceedings,” op. cit. 20 Marko Peljhan, ibid. For a study of control as the temporal modulation of attention, see Maurizio Lazzarato, Les révolutions du capitalisme (Paris: Les empecheurs de penser en rond, 2004). 21 For considerations on the role of mapping in the critique of capitalist globalization, see my text “Flowmaps: The Imaginaries of Global Integration,” online at https://pzwart.wdka.hro.nl/mdr/pubsfolder/bhflowmaps. Other references can be found at http://www.u-tangente.org. 22 See Maurizio Lazarrato, “Du biopouvoir à la biopolitique,” in Multitudes 1, Paris, March 2000, online at http://multitudes.samizdat.net/article.php3?id_article=207. An English translation is available at http://www.generation-online.org/c/fcbiopolitics.htm. 23 See Chaosmosis, op. cit., and Cartographies schizoanalytiques (Paris: Galilée, 1989). For an introduction to the way that complexity theory is deployed in A Thousand Plateaus, see Mark Bonta and John Protevi, Deleuze and Geophilosophy (Edinburg University Press, 2004). This entry was posted on March 27, 2007 at 12:47 pm and is filed under 1. You can follow any responses to this entry through the RSS 2.0 feed. You can leave a response, or trackback from your own site.